Why go to the stars? Because we are the descendents of those primates who chose to look over the next hill. Because we won’t survive here indefinitely. Because the stars are there, beckoning with fresh horizons. As this book was being created, word came that an Earth-sized planet had been discovered circling Alpha Centauri B, one member of the three-star system closest to us. Alpha Centauri Bb is locked facing the star, a hellish half-world indeed, with a frigid, dark shadowed hemisphere. This rocky planet around our nearest neighbor has ignited interest in sending probes there, as a first venture into interstellar space. Moreover, based on results from NASA’s Kepler spacecraft –looking for planets around stars in a segment of the sky–we now know that multiple-planet systems are common, especially when small rocky planets are found close to the central star. Plausibly, Alpha Centauri A–the bigger partner of Centauri B, and closer to it than Pluto is to our Sun–has a good chance to also host planets. Observations and calculations indicate that massive gas giants are ruled out in the Alpha Centauri system, but rocky planets are now ruled in, as we now know that at least one exists. The dimmer third star of the Centauri system, Proxima, lies a fractional light year away from the other two, but it is of interest for exploration. 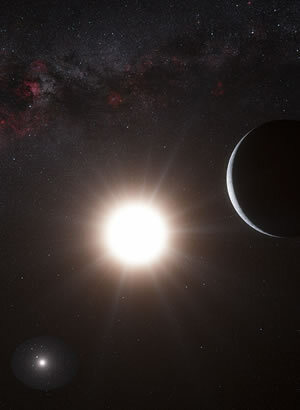 So we have nearby the best situation: three stars that may have earthlike planets, but can be explored together. Intensive observations of the Centauri system are underway and in a few years we will know much more about it. This will doubtless fuel further interest in building telescopes to observe the planets in the Centauri system and probes to voyage there. This is what we have done with the outer planet explorations of the last 30 years in our solar system. This process continues; this adventure will continue. We can now begin to develop the technologies to reach out to the nearby stars, for our observations are bringing them into the realm of what we might call Known Space. Whatever the reason, there is a growing interest and effort toward the greatest challenge we can imagine. To begin exploring other stars within a century opens up grand panoramas. Scientific, technical, biological, social and economic challenges abound. But we can now see how to meet those challenges. Despite all the difficulties, interstellar travel is possible. A potentially pivotal event took place in October 2011: the 100 Year Starship Symposium. Its goal was first to set a bar high enough and hard enough to seriously challenge the next generations. Second, to inspire by showing the scope of the problems and possible solutions. The Symposium felt much like a science fiction convention with solid content and a zest seldom seen. DARPA intends to spur research and select an organization that will sustain and develop interplanetary resources over the next century, culminating in an interstellar launch. David Neyland, the director of tactical technology at DARPA, spoke of “creating a culture centered on human expansion into the solar system, and onward to the stars.” A science fictional staple, yes—so it needed sf writers, who appeared on several panels and gave papers. Still, “Vision without execution is daydreaming,” as Neyland dryly noted. The distances are enormous. If you made a scale model of the distance between Earth and the Moon inside a large 60 foot-long meeting room, on that scale the nearest star (Alpha Centauri) would be as far away as the actual Moon. The speed needed for interstellar flight is sobering. In thousands of years, humans have progressed from a stroll (4 km/hr) to an astronaut’s return from the Moon aboard the Apollo spacecraft (40,000 km/hr). That’s a factor of 10,000. Reaching nearby stars in reasonable time, say decades, would require a velocity jump of another factor of 10,000 – close to the speed of light. To do that in a century means increasing the velocity 100 times faster than we did over the last ten millennia. By comparison, the fastest rocket we’ve ever sent into space would cover the distance to the Alpha Centauri system in seventy-four thousand years! As detailed in this book, lightweight sails driven by beams of microwaves or lasers might promise to cover this immense distance in less than a thousand years. For you and me, there isn’t much difference between a thousand years and seventy-four thousand years. But in the lifetime of civilizations, the difference between these numbers is significant. Any interstellar transport must require a steady buildup toward high velocity vehicles. Many expected to see this after the Apollo landings, but politics did not work that way. Congress came to see NASA primarily as a jobs program, not an exploratory agency. Slowly, NASA complied with the post-1972 vision—safety-obsessed, with few big goals for manned flight beyond low Earth orbit. Very little science got done in the Station. NASA never did the experiments needed for a genuine interplanetary expedition – centrifugal gravity to avoid bodily harm, and a true closed biosphere. We’re not doing that. The Station was not about living in space, but camping in space. This echoed the earlier Russian Mir station, where crews got a weekly vodka, cognac and cigarette ration to pass the time. This entry was posted in Blog, Excerpts and tagged 100 Year Starship, 100yss, Alpha Centuri B, DARPA, David Neyland, Greg Benford, NASA Kepler, starship century by Gregory Benford. Bookmark the permalink.